Michelle Bird is a perceptive and highly experienced workplace investigator, often called on for her ability to take overwhelming or complex information and distill it into clear, concise communication for her clients. An analytical thinker and attentive listener, Michelle is a calming influence when emotions run high. Michelle sees workplace investigations as an opportunity to help employers understand and identify potential systemic issues, and contribute to healthier, more respectful workplaces. At Rubin Thomlinson, Michelle conducts workplace investigations into allegations of harassment, bullying, poisoned work environments, and other problematic workplace behaviour. Michelle also assists her clients by providing workplace investigation and human rights training to staff at all levels. Michelle’s practice also includes workplace assessments and reviews. 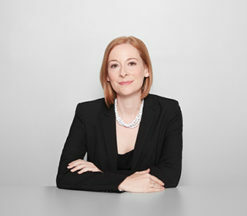 Before joining Rubin Thomlinson, Michelle spent eight years working for the Office of the Ontario Ombudsman where she conducted investigations and wrote reports, drafted standing committee submissions and conducted training sessions for both provincial and municipal government stakeholders. Michelle has also worked for a firm that specializes in workers’ compensation law where she conducted numerous training sessions for employers on managing WSIB claims and on creating healthier, more productive workplaces. Michelle also articled at the Workplace Safety and Insurance Appeals Tribunal. These experiences taught Michelle how drastically an individual’s work environment can impact every aspect of their lives. Lessons from the Hill: What employers can learn from the Senate’s harassment policy reforms.